Postoperative gastroparesis and bile reflux are among the more problematic complications of upper abdominal surgery. 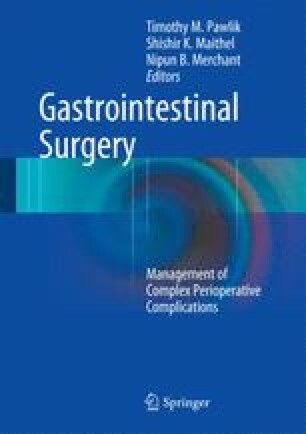 Gastroparesis has received much attention in the literature as a complication of pancreaticoduodenectomy, but is, perhaps, an even more troubling complication after other foregut operations (e.g., gastric resection). Characterized by nausea and vomiting in the presence of distal bowel function, the diagnosis of gastroparesis requires exclusion of a mechanical obstruction. Persistent gastroparesis can result in malnutrition and have a profound impact on the quality of life. Bile reflux is most often a sequelae of gastroduodenal resection or ablation of the pylorus and its mechanism is intuitive. Although bile transits the stomach and may reflux into the esophagus after typical gastric and duodenal resections (except for those in which a roux-en-y reconstruction is utilized) and is often accompanied by mild mucosal irritation, the clinical syndrome of bile reflux develops in a minority of patients and is characterized by symptoms of pain and vomiting refractory to pharmacologic or behavioral intervention. Characterization of specific factors contributing to both of these complications and effective therapies are lacking. Remedial surgery has a role in the management of both clinical entities but careful patient selection is critical in achieving good outcomes.